Arjan then informs me that Ferry Corsten has just sampled that very track that flopped in 1990, into his new single 'Fire', and its blowing up Europe!. How does the world just somehow come together like this? This is my life. Weird occurrences like this happens to me all the time. So I edited the Wiki for the original song. Look at my name in lights, man. Yo. Word. I've added it as a 'Retro Reborn' track on my radio station, which now has a website. It's a bloody good remix. Oh, and I got my U2 ticket, thank christ for that. I was just about to leave a comment asking what the first single off that album was... then it came to me. Violence of Summer?? I used to have a cassingle (*chuckle*) of that song and loved it! 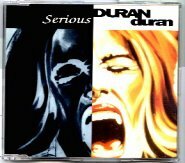 Never heard "serious" before though. I had completely forgotten about this Duran Duran phase til now. Spot on. I'm looking forward to hearing that along with every other DD single this Sunday night (on Retro Hit Radio). I reckon their worst album was Pop Trash from 2000. Trash it was.